Yes, I’m cheating. But I think it’s worth it! 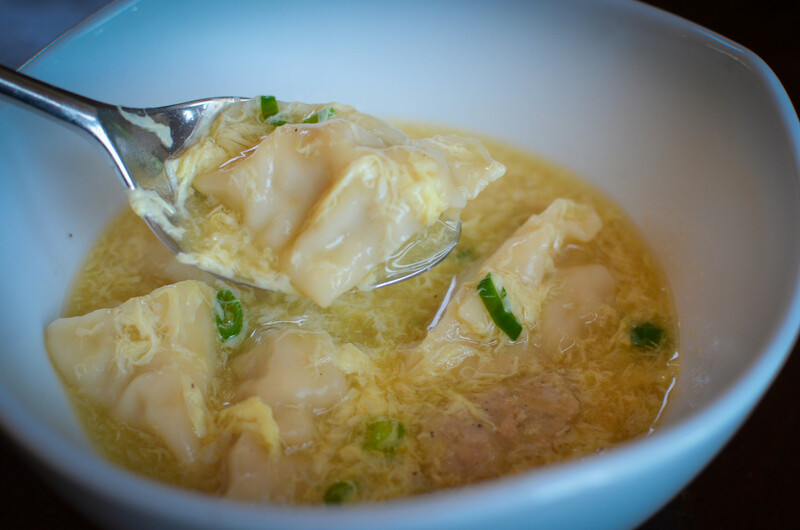 Try this twist on Egg Drop Soup – we cut open the potstickers in the soup to let all the yummy juices flavor the soup. SO YUMMY! I hope you like it! Dissolve the arrowroot powder in about 2 tablespoons of stock. Pour the rest of the stock into a stock pot, and add ginger, and soy sauce and bring to a boil. Slowly pour arrowroot mixture to the soup, and stir to thicken. Once cooked, cut the potstickers into 2 or 3 pieces, using clean kitchen scissors so the juices of the potstickers help flavor the broth. Pour the egg slowly while stirring the soup, so the egg feathers in the soup. Turn off the heat, and add onions. Hi Amber! I am wondering if you have a printed recipe for this. I would like to make it, but I can’t find the recipe on your website. Thanks! So sorry Lauren, we forgot to put it on our site! It’s there now. I hope you like it and thanks for visiting! of servings in the future?